Last Thursday I started my “Throw Back Thursday (TBT)” series (which I’ll now do every other week) by sharing about the time a bank wouldn’t take my thousands of dollars of $1 coins. While I don’t plan to make every TBT story about myself, the next one I wanted to share was about the time we took days’ worth of business class flights around the Pacific, Asia, Australia, and the Pacific and back again for 40,000 miles. This is not only one of the best redemptions in my life, but it was a pivotal moment in the blog. … Actually, mostly it was just one of the best redemptions I’ll ever make in my life. May I please discover another loophole like this someday! Like many of the things I discovered at the time, it was because I was spending hours playing around trying to book ideas myself. This is why I was able to discover so many of United’s routing rules back in 2012, because I spent hours doing trial and error, and writing down my results. (I got lucky that the same trial and error process let me get my head around all of United’s routing rules when they changed the program in 2016, but that’s the process… mostly error). I noticed that an intra-pacific flight was 12,500 miles in economy and 20,000 miles in business class. But looking at the route map, it was apparent that there were no flights between “Micronesia” – islands like Guam, south of Japan – and “Polynesia” – the islands in the south Pacific, east of Australia. The only routes between Micronesia and Polynesian islands took you through Asia, Australia, and New Zealand. When you have an odd thought like this, the first thing to do is to go test if it works. So I went to United.com and searched for a flight from Guam to Rarotonga… and despite the crazy routing, it still priced out at 12,500 miles, and 20,000 in business class. The crazy thing about this is that if I had priced a ticket from any other region I flew through to any other region, it would have been way more expensive. But this ticket that touched on all of them was still a much lower price. United.com would work on certain days but not the days I needed… So I had to call. This was especially painful as I was in Asia and didn’t have tmobile or Google Fi yet. So I had to load $10 of credits into my Skype account and make a phone call on my laptop. And I believe I made the call from a crappy hotel with crappy wifi in Chiang Mai, Thailand, and it took forever, and the call dropped multiple times. Does anyone remember those days? I remember being so frustrated and having to walk through an itinerary step by step. The craziest part is that you’re not supposed to have a stopover on a ticket within the same region… But for whatever reason it worked. Probably because it touched another region, but why wouldn’t it take the higher New Zealand price? I don’t know. Regardless… Let me tell you about the results. We flew to Guam (I believe on Avios from Japan) and stayed there for two weeks. We had an amazing time, snorkeled all over the island, made friends, hiked, etc… It was truly one of the most fun trips of our life, partly because of our luck of making a new friend who hosted us and took us around the island. But ultimately, we decided to also visit Saipan (there was a deal at the Hyatt Regency there) and “return“ to Guam for our “roundtrip”. We flew on Asiana business class to Seoul, hung out with a friend who had moved there, and then got a red-eye to Singapore. I thought I’d get a decent sleep on Singapore’s lie-flat business class, but it turns out a 6.5 hour flight isn’t enough for me to get a great night’s sleep. And for some crazy reason, we didn’t check our bags (habit), so we had a very full day in Singapore… with our bags (which included snorkel gear we got in Guam, to enjoy the next couple islands)! The good news is, that after multiple visits to Singapore, I realize a day is all I need. It was as good as any visit. Actually, it was a better than normal visit, because the Singapore Business Class lounge food was great! We flew Singapore Airlines business class onward too, and we got a nice long stopover in New Zealand, where we had two very different detours. 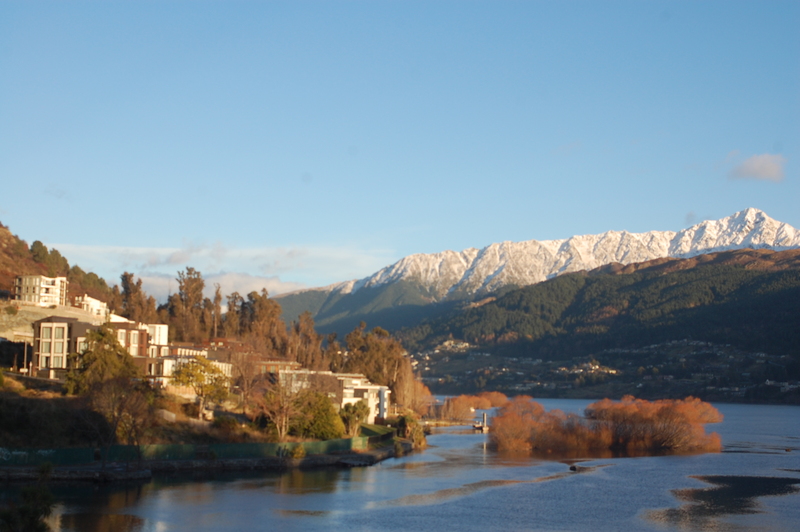 First, we went down to Queenstown. I don’t know what prices are like now, but at the time we could book the Crowne Plaza and Hilton for $50 to $100 a night, and there was a huge promotion with IHG, including one that gave a $75 Mastercard giftcard. Also, New Zealand is pretty amazing, btw. The InterContintal Fiji was on PointBreaks for 5,000 points a night! Yes, folks, those were the days! I think it was going for $400+ a night at the time, and it was a beautiful experience. However, this was right before these brands started offering free wifi as a “benefit”, so the rates were astronomical, and so was the food (although we could walk a little way to get to cheaper food). The IC Fiji was amazing, but the best part was the boat trip we did to the Yasawa islands. Either way, another surreal stopover. After we got back to Auckland and spent a night, we got an Air New Zealand Business Class flight to Rarotonga. For whatever reason, this was by far my favorite business class experience of that trip. The bed, the food, the service. Everything was fun. However, this became an infamous story of our own, that I won’t go into right now… As they also have great wine, and we had no plans for where to stay. Long story short, we landed in Rarotonga and hitch-hiked, and the person who picked us up informed us that she knew of no hotels in our price range… BUT, she had a house that was between tenants. She called her partner and then offered to let us stay the two weeks in her 3-bedroom house for ~$250. We had a great time hiking over the island, snorkeling with a moray eel, and hanging out in our 3 bedroom house for 2 weeks. This was our first time in Sydney or Australia and we stayed at the Radisson Blu, but didn’t sleep much because we were so eager to see all the sites til late. A quick little detour was flying via Bangkok on Thai Airways, because it was a thing for people to brag about their Thai Lounge experience that included a massage. I realize now that I’m sure the First Class lounge was more bragged about than the business class lounge, but it was my first professional massage ever, and that little massage made my day. We were supposed to go back to Guam, per the rules of the ticket that allowed us a great price and stopover. However, AA had off-peak pricing from Japan to the US if we could get off in Japan. Again, if I had done a ticket from Polynesia to Japan, it would’ve been more expensive, so I got a flight (I believe on United) from Tokyo to Guam and we just got off in Tokyo. And all that flying was 40,000 miles in business class! Although, personally, even in business class it was too much straight flying for me. Especially the Sydney to Bangkok to Tokyo flight as I was on Thai Airways’ old angled business class, which I couldn’t sleep on. It was such a steep angle that I would slide right out while sleeping, and wake in front of the plane’s door, right behind first class (as we were the front row of business class). And while I definitely plan ahead more now, the not-planning-ahead led to some amazing adventures and a great deal on a house! Either way, it remains one of the best deals I’ve gotten with miles. I have to assume that you can’t do this route anymore? Anything close to it?